Hollywood is littered with stories of aborted attempts at moviemaking, with many directors finding themselves unceremoniously ousted from a project when a studio gets cold feet and rejects their work. Writer-director Paul Schrader found himself in this position when he completed filming on a prequel to 1973's The Exorcist in 2004. With Renny Harlin replacing Schrader in the director's chair, then reshooting the movie in its entirety, it seemed Schrader's vision would be forever shelved alongside countless other terminated projects. 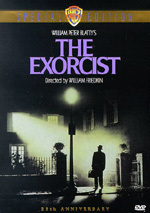 However, 2005 saw a remarkable turn of events, as Warner Bros allowed Schrader's version of the film to be released under the name Dominion: Prequel to the Exorcist. As I noted when I reviewed 2004’s Exorcist: The Beginning, that movie went through a tremendously rocky road to get to the screen. In fact, the film essentially was one big re-shoot. Renny Harlin directed the released version, but Paul Schrader filmed – and finished – his own take on the story first. The suits didn’t like his edition and went back to the drawing board with Harlin. Usually if something like this happens, the rejected movie gets lost to the ages – or at least until decades later. Through the magic of DVD, the future is now! Titled Dominion: Prequel to the Exorcist, fans can check out Schrader’s original take on the tale. Dominion starts with a prologue set in Nazi-occupied Holland during 1944. The authorities believe that a villager killed a German soldier so their leader orders Father Lankester Merrin (Stellan Skarsgard) to tell him the name of the culprit. He states that no one in the village did it, but that’s not good enough. As retribution, the Nazi will kill 10 locals and demands that Merrin select the condemned. He initially refuses to do so, but when confronted with the potential slaughter of all the villagers, he picks some men. Unsurprisingly, this leaves him psychologically wounded. We move to British East Africa in 1949 and find that Merrin has taken a leave of absence from the church to get into archaeology. He investigates a Christian church built centuries before but seemingly untouched by the elements. He works with Father Francis (Gabriel Mann) in this regard as well as with the Africans, though they’re not entirely comfortable with the Christian elements. We meet a deformed local boy named Cheche (Billy Crawford). The villagers shun him and beat him, but nurse Rachel Lesno (Clara Bellar) tends to his wounds. Cheche becomes well liked by Merrin, Francis and Rachel, though it eventually appears that some of the villagers’ fears might be well founded since he slowly shows signs of demonic possession. Other odd things start to happen as well. The British military comes in to prevent looting of the valuables in the dig. However, some of those men try to pilfer jewels and end up dead in a very strange, ritualistic presentation. This inflames passions between the British and the Africans, neither of whom likes the other under the best of circumstances. The movie follows those tensions as well as developments in the supernatural realm. If a studio rejects a movie or a record label shoots down an album, the work in question often becomes legendary. People automatically assume that if the suits view something as too non-commercial, it must be really good. That’s not always true, though, and anyone who expects to find some sort of lost gem in Dominion will walk away disappointed. A classic this is not, and it pales in comparison to the original Exorcist. That said, it’s not a bad piece of work, and it certainly works much better than the atrocious Harlin version. His take was little more than a cheesy horror flick with some religious elements grafted onto it. Schrader pours on fewer shock elements as he prefers a more psychological approach, and this decision usually succeeds. Actually, if anything, I think Schrader should have made events even more subtle and less defined than they are. During much of the film, he focuses mostly on the evil in men’s hearts and all those problems that exist without the assistance of demons. It’s man’s inhumanity to man that drives Merrin from the church in the first place, and as the film examines the relationships between the Africans and the British soldiers, it looks at various forms of prejudice. In a positive move, neither side gets off without criticism. Usually movies prefer the Dances With Wolves viewpoint: the white folks are bigoted idiots while the non-whites are noble and wise. Dominion doesn’t particularly favor either side. Instead, it shows the flawed assumptions both groups make and the way those attitudes cause problems. It’s almost a shame that Dominion eventually portrays the demons as real, for I think it’d be more interesting to look at those seemingly supernatural events as possibly being the results of bias and over-active imaginations. The movie’s at its most interesting during those segments. However, I know that Dominion has to establish the existence of the demons because it exists as a prequel to Exorcist. We need to see what affected Merrin to make him the bitchin’ exorcist he’d later be, and some events of questionable spirituality wouldn’t cut it. Unfortunately, the more real the demons become, the less interesting I find the movie. The flick turns into a more standard affair at those times and lacks the intrigue of the prior moments. Nonetheless, Dominion has enough good bits to make it a fairly satisfying lead-in to The Exorcist. I always liked the premise, as that was pretty much the only good thing about Beginning. Dominion doesn’t present great depth, especially via its fairly thin characters. Not even Merrin develops terribly well. Still, the movie explores things to an acceptable degree and turns into a moderately intriguing piece of work. Dominion: Prequel to the Exorcist appears in an aspect ratio of approximately 1.85:1 on this single-sided, double-layered DVD; the image has been enhanced for 16X9 televisions. Although much of the film looked great, it was far too rough around the edges. Sharpness wasn’t one of those problems, though. Despite some mild edge enhancement, the movie remained tightly focused and rarely demonstrated any signs of softness. Instead, it stayed crisp and detailed. I noticed no jagged edges or shimmering. As was the case with the Harlin version of the film, the flick went with a pretty stylized palette. Gold dominated matters, as it reflected the sandy setting and spread across much of the film. Some natural tones came out as well, mostly in regard to reds. The transfer brought them out well, as it represented the tones quite solidly. Blacks were tight and firm, while shadows consistently demonstrated good depth and clarity. So where did the transfer go wrong? It demonstrated far too many source defects. Clearly no one cleaned up this flick for its home video appearance, as many specks and marks popped up throughout the movie. I also saw oddities like a variation in shadow depth during one scene between Father Francis and Cheche; right in the middle of a shot, the tone changed for no logical reason. All the print concerns came as a real disappointment, for almost everything else about the transfer looked great. Unfortunately, these problems created significant distractions and caused me to lower my grade to a “C+”. On the other hand, I found no problems with the fine Dolby Digital 5.1 soundtrack of Dominion. The soundfield didn’t create a dazzling affair, but it accentuated the action. The audio helped create a nice enough sense of setting and cranked into higher gear during the spookier scenes. Since Dominion didn’t go for haunted house jolts or high-tension action, this meant that we didn’t get a lot of visceral material. However, the mix used the five channels well to open up matters, especially during demon-oriented shots. In those, the surrounds contributed a lot of information and ended up a reasonably creepy. Audio quality was very good. Speech consistently sounded distinctive and concise, as I noted no problems in that domain. Music was also bright and dynamic. The score probably could have demonstrated a little greater oomph, but the score remained well-represented. Effects came across as rich and full, with clean highs and deep lows. This was a consistently satisfying soundtrack. Renny Harlin’s Exorcist prequel lacked lots of extras, and Dominion falls along the same lines. The most significant component comes from an audio commentary with director Paul Schrader. He offers a running, screen-specific chat. Anyone who expects fireworks from Schrader will walk away disappointed. He provides a moderately informative look at the making of the film with little embellishment. Schrader gets into the usual basics. He talks about sets and locations, the cast and their work, visual effects, music, and story/script issues. Schrader deals with the film’s controversies in a roundabout way. He acknowledges that Dominion doesn’t make a very good horror movie and states that he didn’t try to create a standard flick of that genre. He discusses the problems with the story as a horror piece but doesn’t go beyond that to other concerns. True highlights are rare in this commentary. Schrader tells an interesting story about interactions with Mel Gibson while the latter made The Passion of the Christ nearby, and he also has good notes on subjects like working with hyenas. Overall, though, the commentary tends to be low-key and pedestrian. It lacks much sizzle and acts as a competent but none too exciting look at the production. Six deleted scenes fill a total of five minutes, 20 seconds. These largely fall into the category of small character moments that don’t seem particularly necessary. We also get an expository moment or two. The movie doesn’t lose anything due to their omission. Finally, a Still Gallery includes 14 photos. We find lackluster images from the set and nothing more than that. It may not live up to the heights achieved by The Exorcist, but at least Dominion stands as a substantially better flick than Exorcist: The Beginning. Despite some flaws, the flick presents a reasonably intriguing exploration of spirituality and prejudice. The DVD offers strong audio but it suffers from too many picture flaws and it doesn’t include a substantial roster of extras; a decent audio commentary is the main attraction. I like the movie enough to recommend a rental, but I can’t advise anything stronger than that.